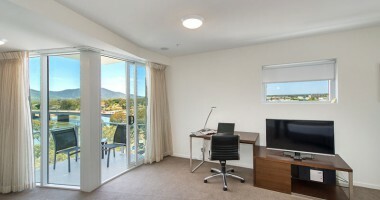 Modern Luxury in a King Studio Hotel Room Suite at Empire Apartment Hotel Rockhampton. Our spacious open plan King Studio Suites feature a work desk, two stylish arm chairs, and a balcony or terrace. The King Studio Hotel Room Suites at Empire Apartment Hotel Rockhampton are also available as a Twin Room (King bed split into two) upon request. King Studio Hotel Room Suites at Empire Apartment Hotel Rockhampton have a maximum occupancy of 2 people.